The highly regarded Viking 53 Convertible delivers a proven mix of style, luxury and performance. Lavish (3) SR interior with mid-ships Master, Salon, Galley and Dinette area, standard washer/dryer and upgraded furnishings. Fresh MAN 820 HP power cruises 26/27 knots and 30 knots at WOT. Island Hopper has had thousands spent on her since 1/1/17. See complete list in listing. Seller is no longer using and is motivated. pulpit & windlass system as well as a davit for a tender. port side with a cocktail table, L­shaped dinette to starboard with a Plexiglas dining table. The full galley is to port. large single berth with access to the 2nd head & shower. coverings, wood window blinds, mica counter tops and ultra­leather sofa and dinette. Salon: Flat screen TV, AM/FM receiver, 5 disc player, VCR, DVD, All Sony. 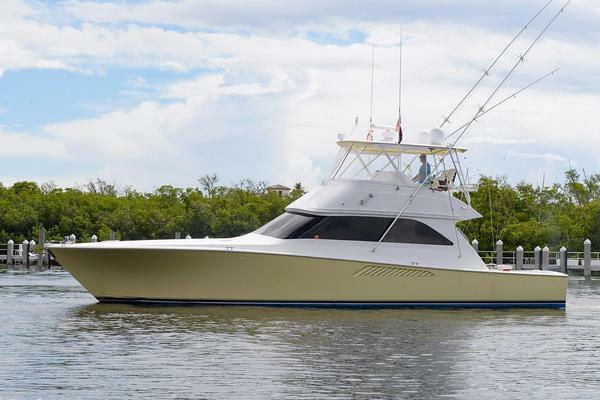 ex F-Troop is a very clean and well maintained 53’ Viking featuring low hours on rebuilt motors. Equipped with everything needed to fish and cruise, this Convertible is a must to see when considering a sport fisherman.